In this exclusive, Cornel West talks Bernie Sanders’ neo-populism, Donald Trump’s neo-fascism – and sweeping away the myopic careerism and chronic narcissism that prevented any serious critique of Obama's neo-liberalism. 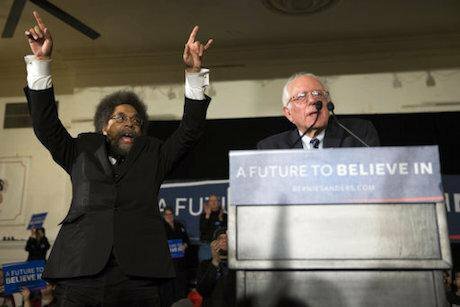 Cornel West and Bernie Sanders. Evan Vucci/AP/Press Association Images. All rights reserved.Last year, when Bernie Sanders announced his candidacy for the Democratic nomination for the US presidency, few believed that it would have any success. Many assumed that the public endorsement of ideas like ‘democratic socialism’ or ‘political revolution’ would alienate the American political electorate. But what followed was a series of surprising victories in several states. Few are more appropriate to explain such developments, along with the troubling rise of Donald Trump, than the American philosopher and public intellectual Cornel West. His work on the role of race, gender and class in American society, and his political experience as prominent member of the Democratic Socialists of America gives him an insightful understanding of today's political momentum, and its meaning for the left. His voice has even greater significance within the current American political scene, considering that Sanders selected him to be part of the Democratic Party platform-writing body. George Souvlis (GS): What is the legacy of the Obama administration? Cornel West (CW): We are at a crossroads in American history. We must choose between a neo-fascism in the making (Trump), neo-liberalism in the decaying (Clinton), and a neo-populism in the ascending (Sanders). The establishments in both the Democratic and Republican parties are disintegrating. Obama is the last gasp of the neo-liberalism that emerged under Carter: a massive response to the structural crises of the global economy in the mid-70s. This attempt to financialize, privatize, and militarize our way through deep problems – from the economy, education, incarceration, security and communication – has produced vast wealth inequality, cultures of superficial spectacle, and pervasive corruption in every sphere. Both political parties have been complicitous. Much hangs on how the Sanders campaign is treated in July, and what we critical Sanders-supporters do after July. GS: How do you view the Trump phenomenon? CW: Donald Trump is a billionaire pseudo-populist with an autocratic sensibility, narcissistic personality, and hence a neo-fascist in the making. His project brings together a lethal mixture of big banks, huge corporations, xenophobic scapegoating (Mexicans, women, Muslims, Blacks, and non-straights), economic anxiety and national malaise tied to militaristic aspirations abroad. This is what US-style fascism looks like – echoes of Sinclair Lewis' It Can't Happen Here (1935), the classic novel of American fascism. GS: Bernie Sanders calls himself a democratic socialist, what does that political tradition mean to you? CW: Despite Sanders' self-definition as a democratic socialist, his platform is vintage neo-populist: principled use of the government to come to the rescue of working and poor people crushed by Wall Street greed and upper middle-class indifference to the disappearing opportunities of vulnerable fellow citizens. We saw the government come to the rescue of Wall Street and we see how lobbyists ensure the security of the well-to-do. Sanders' neo-populist appeal is timely and understandable. As a democratic socialist for 35 years and hence a comrade to my dear Brother Bernie, there is no doubt that he is running on a neo-populist, not democratic socialist, platform. GS: If Sanders fails, how do you think a social movement can emerge out of his campaign? CW: Political campaigns are not social movements. Even great campaigns like those of Jackson in the 80s, Obama in the recent past or Sanders today are not social movements. We must distinguish between social momentums, social rebellions and social movements. Given the massive national security state and the pervasive carceral state, social movements are rare – past, present and future. The American Empire is more ripe for a counter-revolution than revolution, for right-wing movements than left-wing ones. This is so primarily because of the deep xenophobic roots in the country and profound militaristic sentiments in the culture. Hence, progressive social momentums and chaotic social rebellions are more likely to reshape our priorities and gain some concessions from greedy elites and callous citizens. This is why moral and spiritual dimensions of social activism are crucial – to sustain our will to fight inside and outside the system with little chance of immediate victory! GS: What do you make of the debates about why Bernie Sanders’ message doesn’t seem to be resonating as well with some black voters? CW: Black people are the most progressive voting bloc on issues of the economy, racism and education. Bernie Sanders is the most progressive candidate on these issues. So far, Black people remain tied to the familiar neo-liberal project of Clinton than to the relatively unknown Sanders. Black people fear Trump. They are reluctant to make a change with the much less known Sanders. But as many of us have argued – like Adolph Reed, Jr. and Michelle Alexander – Clinton's neo-liberal and militaristic policies have done much damage to working and poor people here and abroad. The high visibility of neo-liberal Black politicians, corporate media pundits and intellectuals make it difficult for us to have strong impact. Yet evidence is mounting that the Clinton machine – wrapping itself in Obama's costume – is running out of gas. The neo-liberal sleepwalking in Black America is coming to an end! GS: What kind of organisational form do you see Black Lives Matter taking in the future? CW: The emergence of Black Lives Matter momentum is a marvelous new militancy that is the early signs of the shattering of the neo-liberal sleepwalking in Black America. This emergence exposes the spiritual rot and moral cowardice of too much of Black leadership – political, intellectual and religious. The myopic careerism and chronic narcissism that prevented any serious critique of Obama's neo-liberalism are now out in the open, owing to the courageous young people who stood in the face of military tanks in order to show their love of those shot down by unaccountable police under a Black president, Black attorney general and Black homeland security cabinet member. What an indictment of neo-liberal Black power in the face of massive Black suffering, highlighted by Black Lives Matter activists. And this is just the peak of an iceberg melting for Black elites, who went silent and opted for symbolic crumbs, when precious poor Black people were being crushed. Martin King, Malcolm X, and Fannie Lou Hamer cry out from the grave – then smile at the Black Lives Matter activists.